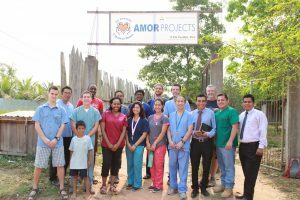 At AMOR Projects we are proud of our student missionaries. Our current group all plan to stay from September 2017 until late spring of 2018. We look forward to another year building great memories in service for our Lord. My name is Skyler Davis and I am serving this year as the Administrative Assistant with AMOR Projects. I am a Junior finance major at Southern Adventist University. I enjoy getting to know people, working out, and playing sports. Hi there! My name is McKenna Wear and I am a Physical Therapy major at Andrews University. I am here in Pucallpa as a physical therapy assistant at an orphanage, helping kids with physical and/or mental disabilities. I chose Pucallpa not only to get hands on PT experience, but also to improve my Spanish. I love swimming, hiking, camping, and napping in my hammock. If you are a future student missionary considering coming to Pucallpa, you totally should! Just remember to bring peanut butter, granola bars, and powdered Gatorade. Just trust me on this. Hola! My name is Elana Harris. I recently finished my sophomore year at Walla Walla University. I am here as a student missionary in Pucallpa, Peru serving as an English Teacher. I like writing, singing, organizing, planning, playing basketball, and skiing. I am here this year for a few reasons. Firstly, I felt called by God to do something out of my comfort zone for him. Second, I wanted to learn and improve my Spanish, since that is the only language, besides English, that I know. Third, I would have been entering my Junior year of college and still had not decided on a major. I hope that this year of teaching will show me whether or not that profession is for me. Hi! My name is Ilyn, and I'm from Los Angels. I just completed my first year at Walla Walla University. During my time in Peru, I'm going to be working as a nurse in the clinic and be involved in the local church. I know that God will help me grow as a person and give me the ability to help others in as many ways possible. I absolutely love mission work, and have been on several short-term mission trips, so I'm happy to be serving in Peru for a longer-term. When I go back to the states, I'll have three years of nursing school left to finish with my Bachelors degree in nursing. I'm excited to see how God will work through me this year! Ayyye it’s Joelle! I am a pre-Physical Therapy student from Southern Adventist University. I am excited to learn new things, make connections, and volunteer at the orphanage near Amor Projects. My goal is to be an extension of Christs healing ministry, to make people feel the love of the gospel. One of my favorite witnessing moments is in Acts 2:37; it says that when Peter had finished witnessing to a crowd, they were “cut to the heart.” What if you were so full of the Holy Spirit that you’re witness cut to the heart. That I believe is what feeling the love of the gospel is all about.